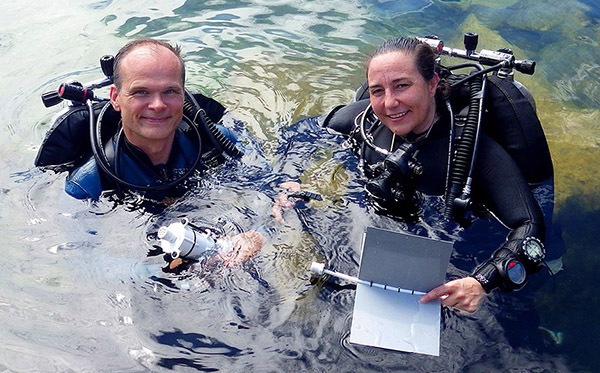 The Cave Pearl Project was co-founded by Edward Mallon and Patricia Beddows: two people who are passionate about understanding caves and protecting karst aquifers. They are developing a data logging platform from inexpensive pre-made breakout boards, and using this at the heart of new environmental sensors that anyone can build. Currently more than 100 of these Arduino based loggers are installed at several well-instrumented field sites, in four different countries. This monitoring network includes everything from surface weather stations to underground drip monitors & micro-climate recorders. Water level and flow sensors are installed in caves, at coastal outflows, and at locations on the reef. Bore-hole pressure loggers and multi-probe temperature profilers have recently been added to the equipment lineup, and new sensor combinations are in development. These long term records support Dr. Beddows research into the links between the landscape, climate variability and water/material fluxes through the vadose zone. This work necessarily spans many years, and is providing valuable process-based understanding of how environmental conditions are recorded in sediments and speleothems. The data is also essential for answering questions about contaminant transport and water supply management in karst regions. This project proves that anyone can build robust instruments with open source tools, and it is providing people with the information they need to get started. This work will have a significant impact on future projects as more community partners and academic collaborators modify these loggers for their own research questions.